from 100 to 1500 pieces! The world's largest selection of traditional and fun Advent calendars! 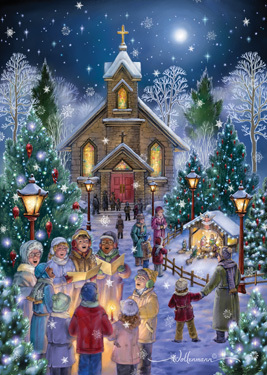 A wide selection of unique Christmas cards. The centerpiece of the Christmas Season! Advent calendars and Advent wreaths heighten the anticipation of Christmas! 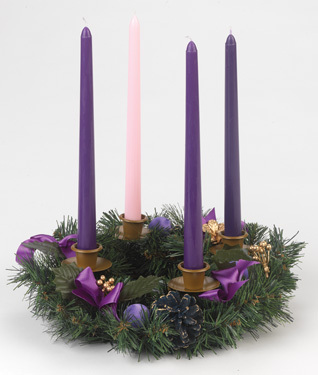 For these Advent traditions, we boast the largest collection of Advent calendars and Advent wreaths, including chocolate Advent calendars, German Advent calendars, both traditional and contemporary Advent wreaths, and even affordable Advent candles. Countdown to Halloween too with our unique Halloween countdown calendars. Halloween countdown calendars are like Advent calendars, but offer 31 days of Halloween countdown fun. Our inspirational and religious Christmas cards celebrate the true meaning of Christmas. Personalize your Christmas cards with us. All of our jigsaw puzzles are both challenging and fun. We specialize in Holiday puzzles including Christmas puzzles, Halloween puzzles and even Easter puzzles. As the leaves begin to fall, Halloween puzzles and Christmas puzzles are perfect gifts. Everyone at Vermont Christmas Company wishes you a Happy Halloween, an Advent season filled with wondrous anticipation and a very Merry Christmas too!